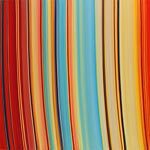 The soft-focus bands of color in Chris Gallagher's new paintings extend from one edge of the canvas to the other and are composed of single, uninterrupted brush strokes. The varied colors in each painting, chosen intuitively by the artist from a complex palette, softly blend into one another and register the hand of the artist through slight imperfections in the brushwork. Initial patterns of horizontal, vertical or arcing lines are built upon multiple layers of paint until Gallagher achieves glowing, vibrating streams of light that suggest cosmological phenomena or the dizzying blur of technological information. 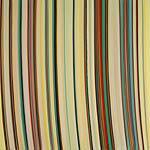 In some of the paintings, the striations are densely packed and seem to be part of boundless fields. 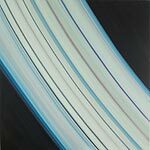 In others, Gallagher has opened up the space between the bands by channeling luminous arcs of color through dense areas of black in a manner reminiscent of planetary rings. The depth and perspective this creates, along with the diagonal orientation of the arcs, greatly increases the sense of velocity. 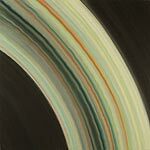 In both types of paintings, the bands seem to expand beyond the edges of the canvas and suggest an incessant flow. For Gallagher, the allusions to the rush of technology and to astronomical exploration contemporize work that adheres to a history of painterly expressionism and abstraction.